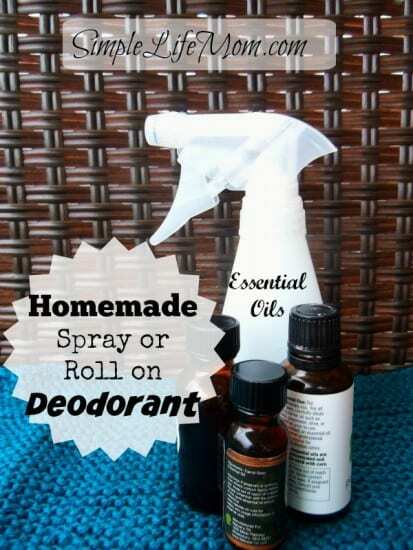 I love my homemade deodorant. It’s just that simple. It’s cheap, made with great ingredients, and I can make it smell however I like. I use my recipe for solid deodorant throughout the year, but especially in the winter. With my solid deodorant, coconut oil melts about 76 degrees Fahrenheit. So I need to keep it in the fridge on hot days. That’s fine since it is refreshingly cool. Yet, another wonderful choice, becoming my favorite because of how completely easy it is, is spray on deodorant. Either way, you can find containers pretty easily. I reuse containers that I have bought in the past, but I’ve also bout some Here and Here. The ingredients really make sense! Witch Hazel is a great astringent. That means it will close your pores and you will sweat less in your armpits. Sweat is not a bad thing. It helps release toxins from your body and cleanse your pores. But we don’t necessarily want to sweat very much from our armpits because bacteria there begins to stink. Baking Soda is an odor and sweat absorber. Essential Oils are great for killing bacteria and giving your body a smell that you choose instead. Aloe Vera is very healing to your skin and an anti-inflammatory. It’s soothing effects are wonderful in deodorants. Alcohol also helps to kill bacteria and has a drying effect that will help with sweat. Clary Sage is a natural astringent. It’s great in deodorants, but it should not be used for pregnant women or those who have hormonal issues (I can’t use it, but I know many women who do). Lavender Essential Oil soothes the skin. Citrus oils such as orange, grapefruit, and lemon. And Other oils that you just love the smell of like Ylang Ylang, Neroli, lemon grass, or peppermint. Try on your wrist first to see if you are sensitive to the oil. A number of essential oils are potent and require dilution in a carrier oil (or in the deodorant) before use. Mix ingredients in a spray bottle. 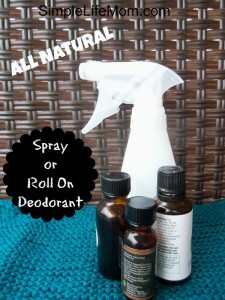 Add witch hazel, aloe vera, baking soda and your favorite essential oils to a small spray bottle. Our family uses coconut oil / baking soda / cornstarch deodorant. We love it. We just did away with the bother of the roll on and we each have a little jar we keep it in. To apply we just rub it between our hands and ~ ‘umm’ ~ apply. A couple of us have found we need to finish it off with a light dusting of corn starch baby power to stay really dry. Wonderful, it really works doesn’t it! I like the spray in the summer and hard bar in the winter. Mine hardens enough after it cools that I can use it in an old deodorant container. To avoid gmo cornstarch, I like to use arrowroot powder instead. This sounds great! I’m currently using my coconut oil+baking soda+corn starch dehodorant as it is winter here and it stays pretty solid during cold months, but in summer it’s very annoying how it melts and this recipe seems perfect for summer! The only issue for me is that I can’t find Witch Hazel, is there any other ingredient I could replace it with? Thanks a bunch for the answer, love your blog! You can replace it with water or aloe, but it really does help a lot with keeping you dry and clean. You can find it online using the link. Can I use the witch hazel that has alcohol in it….I can’t find the alcohol free one…and now I have a new bottle of the witch hazel with alcohol and don’t know what I can use it for. It wasn’t cheap so I want to find a good use for it. You definitely can. It can be drying so I prefer to not use alcohol, but you can use it and use moisturizer afterwards. I would use 10 drops of lavender in 4oz for myself. 40 drops is closer to 2% which is the most I would add. Make sure to shake well before use.